A big Saturday in the world of Boxing was centered on the triple world title fight card that took place at America's Barclays Center in New York, where light middleweights ruled the roost. WBC king Jermell Charlo, 30-0 (15), put on the most impressive performance as he made short work of hotly-hyped contender Erickson Lubin, 18-1 (13), poleaxing the young Floridian in just 2:41 of the first round to notch the second defense of his crown. The boxers spent most of the first frame studying each other but Lubin had started to move in on Charlo behind a few jabs. When Lubin ducked a Charlo punch, the champion dug in a short right hand to the side of the challenger's head, jamming Lubin's neck into a very uncomfortable looking angle. The challenger went down immediately and tried to get up but was not in control of his limbs as he flailed on the canvas, prompting a referee stoppage at the count of six. 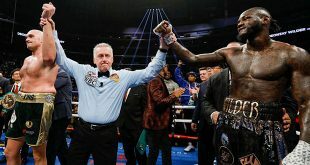 For Charlo, the result was all the more satisfying given the trash talking that Lubin had produced during the media build up to the contest and the 27 year old Houston man has now starched his last four opponents inside the distance. The most entertaining scrap on the bill undoubtedly came in the form of Jarrett Hurd's first IBF title defense, in which the Maryland resident put his belt at risk against New Mexico's former WBA champion, Austin Trout. Trout, 30-4 (17), who has faced far more accomplished opposition than Hurd, 21-0 (15), gave the younger champion a serious boxing lesson over the first half of the fight. Trout looked spectacular, utilizing his quick reflexes and southpaw stance to make Hurd, a very good boxer, look quite ordinary. But producing that remarkable effort expended a tremendous amount of energy as Trout had to maintain constant high-level movement to keep the much taller Hurd at bay, simultaneously punching, ducking, slipping, pivoting and blocking in a non-stop fashion. As the bout wore on, both men were visibly tired and Hurd was beginning to land big shots on the challenger. An accidental clash of heads in the seventh changed the tone of the bout as Hurd was badly cut above the left eye. The champion began to stalk Trout in a very awkward manner, hoping to lure the Las Cruces man into big countering shots and the approach paid off as Hurd was scoring with bracing punches. Trout's right eye began to swell badly and it became apparent that he couldn't see the punches coming from that side as Hurd was badly battering an exhausted man. The tenth round was simply one way traffic as Hurd landed a swarm of hard shots that had Trout reeling, somehow managing to keep his feet. Before the 11th frame could begin, the ringside physician called for a halt to the bout. Trout managed a great, crafty effort but could not keep the younger, bigger Hurd off and didn't have the stamina to maintain his high-energy approach to the fight. Hurd showed great determination to keep going despite taking many flush punches and showed an ability to adapt to the style of a more experienced opponent. 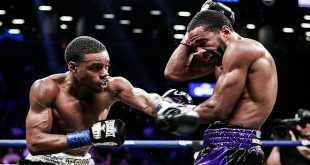 The main event at Barclay's Center was a contest between Texas based Cuban and WBA "super" champion Erislandy Lara, 25-2-2 (14), and challenger Terrell Gausha, 20-1 (9), of Ohio. This was a very low action level bout that, aside from a fourth round knockdown of Gausha by Lara, saw very little actual fighting take place, with both boxers doing more pawing and posing than punching. Gausha was taking a big step up in competition and in light of that, actually did well to be competitive and win several rounds against a far more experienced champion. Southpaw Lara simply had a higher activity rate and won a UD by scores of 116-111 and 117-112 twice, and has now retained his belt on five occasions. Look for Hurd and Charlo to be matched up early next year in a barn burner with the winner facing Lara in what should be an intriguing fight. There was another high profile card on the other side of America on Saturday night as two world champions, and former combatants, in the featherweight division were in fine form at StubHub Center in the Los Angeles suburb of Carson. WBA "super" feather ruler Leo Santa Cruz, 34-1-1 (19), returned from his bruising two fight series with Carl Frampton with an appearance against veteran Chris Avalos, 27-6 (20). The two Californians wasted little time getting right at it, with Santa Cruz imposing his will on his former sparring partner Avalos, from the first round. 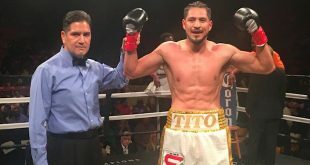 The champion used his offense to keep Avalos from landing much and by the eighth frame was hammering the challenger, prompting a referee stoppage. Santa Cruz will likely now have a rematch against the other big name on the StubHub show, Abner Mares, who lost a WBA title fight to Santa Cruz in 2015. Mares, 31-2-1 (15), defended his WBA "regular" featherweight title against veteran campaigner Andres Gutierrez, 35-2-1 (25), when the bout was stopped in the tenth round due to a bad cut the challenger had sustained in the second frame in this battle of Mexicans. Gutierrez gave a big effort but was outboxed in most of the rounds by the far more experienced Mares, who successfully retained his belt for the first time. Earlier on Saturday, there was a WBA "super" super middle title clash between champion George Groves, 27-3 (20), and fellow Englishman Jamie Cox, 24-1 (13), at Wembley Arena in London. Cox tried hard and had a measure of success once the bell rang but couldn't hurt the more seasoned Groves, who ended matters with a spearing right hand to the body that floored the challenger in the fourth round. Given this was a bout in the World Boxing Super Series, Groves will now faced IBO kingpin Chris Eubank Jr in early 2018, a contest that should be an exciting 50-50 affair.